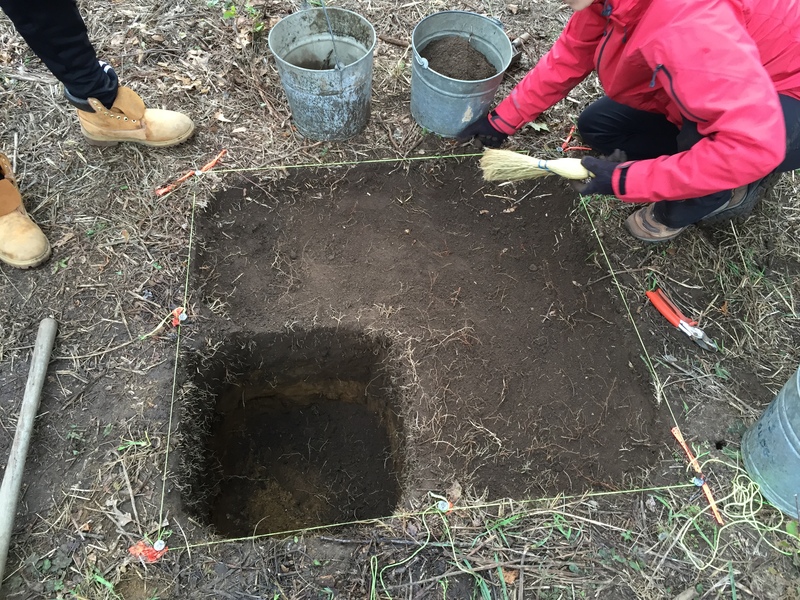 This week’s update on the progress of excavation group four comes courtesy of ANTH60a student, Andrew Elmers. Andrew is a Brandeis University undergraduate student majoring in Anthropology. Group 4 continued our excavation of unit MFS103 on Friday, October 9, part of Operation 1 in the northern part of the McGrath Farm Site despite the forecasted rain. We had reached our third layer – layer C – the week before, which at first presented some confusion. The mottled soil showed some signs that we had reached the subsoil, which would mean we wouldn’t find anything of note in this unit, and other signs of a feature. Upon inspection by Prof. Parno, it was determined that a hard line between two different soil colors indicated a feature, and not the layer of subsoil, and warranted the expansion of the unit. We started off the day by expanding our 50 cm x 50 cm unit to a full 1 m x 1 m unit towards the southeast, using a tape measure to pinpoint the corners. We designated this new unit MFS103.1, with the intention of digging down until we reached layer C for the entire square meter, when we would combine both units back together as MFS103. This will require a lot of digging, since we now have three times the volume to remove as before, and we had reached a depth of about 50 cm in unit MFS103. Luckily for us, we already knew when to expect a new layer to appear and what to look for, so we were able to use shovels to excavate instead of being deliberate with a trowel. Layer MFS103.1A (pictured below) was moved through quickly. A layer of topsoil that extended at most 5 cm into the earth, we created a mini-assembly line of filling up buckets that were then brought over to the tarp to be sifted. 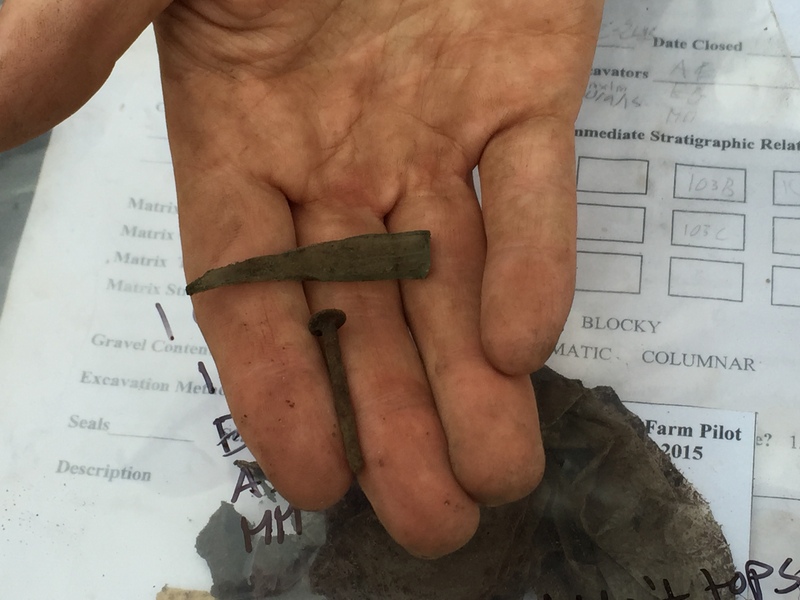 In this layer, we found a good amount of artifacts, including a piece of glass and metal nail (pictured below). The nail was somewhat a comical find, since we found it tangled in with some roots. Our first artifact find a few weeks ago was a nail that was tangled in some weeds as well; we had even reminded ourselves to poke through the root entanglements to make sure no nails or other artifacts were hiding in there. We also found small pieces of ceramic and brick, consistent with our discoveries from layer MFS103A. We then began on layer MFS103.1B on Friday, and found something very interesting. Prof. Parno had pointed out to us while sifting that we had found a piece of slag – a byproduct of smelting or smithing – in the midst of the layer. The feature that we are investigating in MFS103C by expanding the unit could be remnants of a fireplace or furnace, due to the shape of the line in the soil. Presence of slag in this unit could imply the presence of a fireplace or furnace in this area of the site, helping support our hypothesis for the feature. If our hypothesis is correct, it might relate to the oral claims of a WW2-era bunkhouse that housed German POW’s formerly existing in this area of the McGrath Farm Site. Next week, we will continue excavating in unit MFS103.1 until we reach layer C and can investigate this possible feature further.